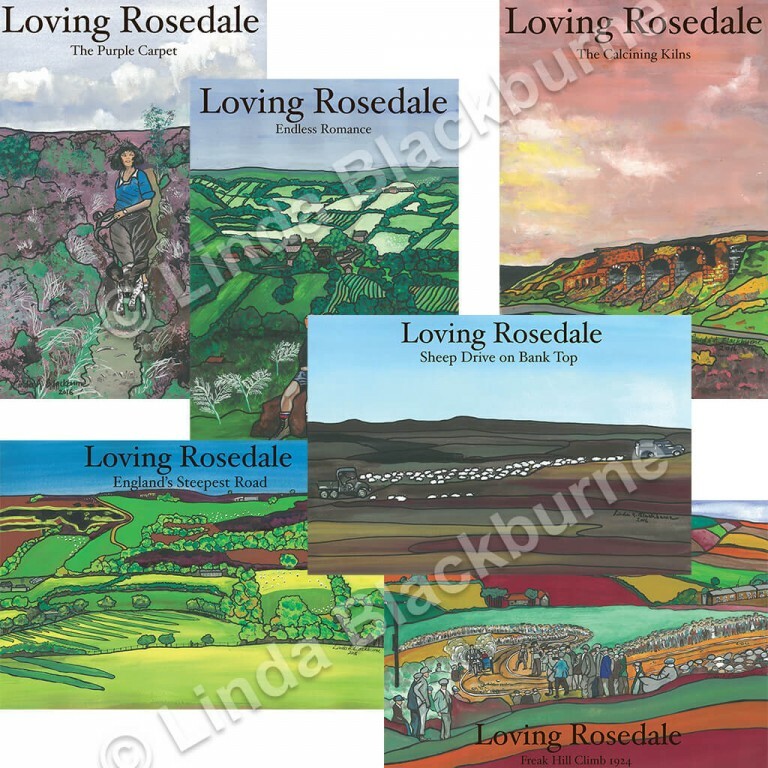 Linda conceived a series of six paintings of Rosedale in 2016 through living and working in the North York Moors National Park. The art cards have been printed with a white border on quality 280gsm card in York. At 21cm by 15 cm (A5), they are bigger than the average card in the shops. They are blank inside for your own personal message and the card back gives a brief description of the painting. The cards are paired with meadow-green envelopes for a country feel and are cellophane-wrapped. They are £3 each or the discounted price of £17 for a mixed set of six (one of each design), including P&P. The posters, which are 31.5cm x 45cm (A3), are on 170gsm paper with a silk coating which makes them relatively heavy for their thickness. Like the cards, they also have a white border. They are posted in tissue paper and cardboard tubes for protection. The posters are £5 each or the discounted price of £29 for a set of six (one of each design), including P&P. Limited-edition, fine-art, giclée prints are also available by special request. 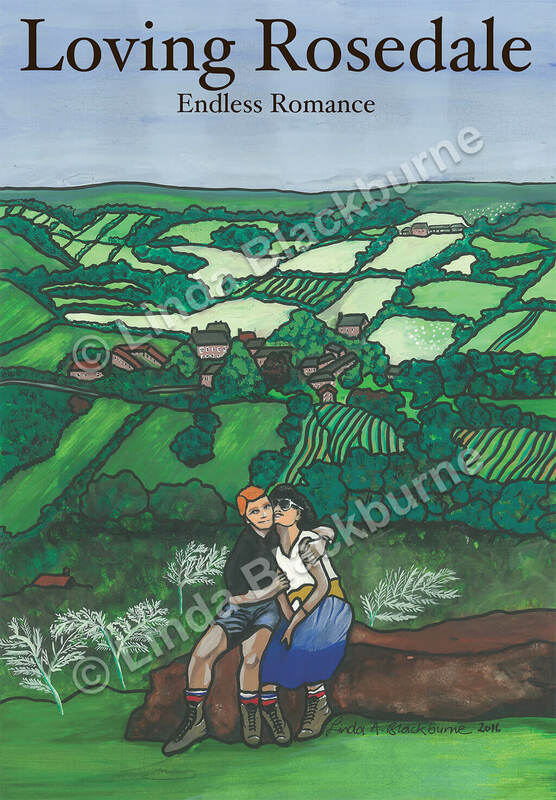 An A3 size print (29.7cm x 42cm), for example, would cost £50. The print can be made with or without the ‘Loving Rosedale’ text. 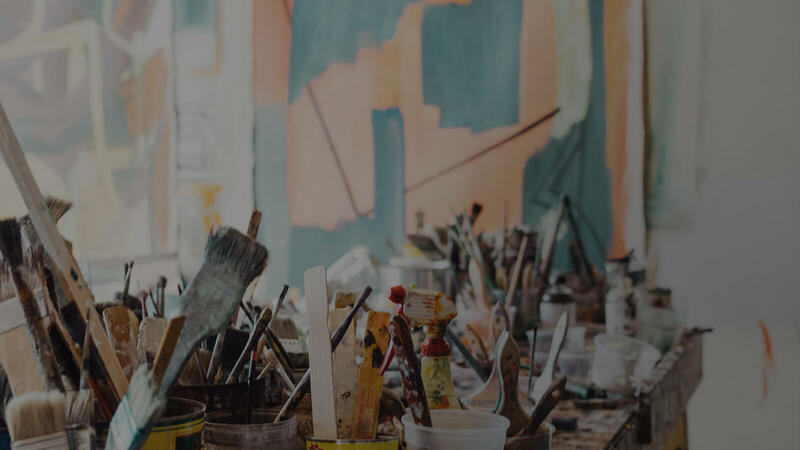 Call Linda on 01751 417833 for an informal chat about your requirements – or send an email to info@therollingenglishcompany.uk. 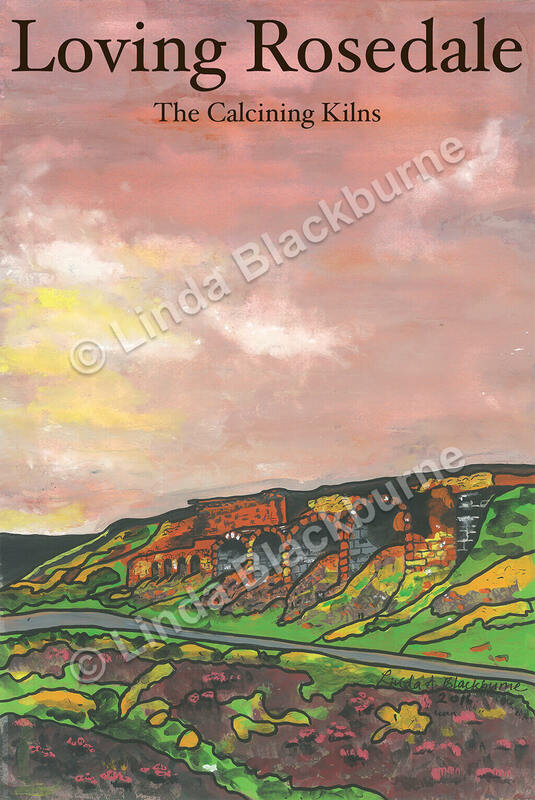 Art cards and posters are available from The Oaks, Gill Lane, Rosedale Abbey, YO18 8SE. Tel 01751 417988 or scroll down to buy online. The cards are also for sale at Graze on the Green cafe in Rosedale Abbey and the Sutton Bank National Park Centre near Thirsk. The tiny village of Rosedale Abbey was transformed into an industrial hub from 1855 until 1926 after the discovery of high-grade, magnetic ironstone. The miners roasted – or calcined – the iron ore to reduce its weight for transportation and remove impurities. Eleven million tons of Rosedale ore helped Teesside coat half the planet in metal. Chimney Bank, which shares the title of steepest road in England with Hardknott Pass in the Lake District, was a stony playground for racing drivers in the 1920s. 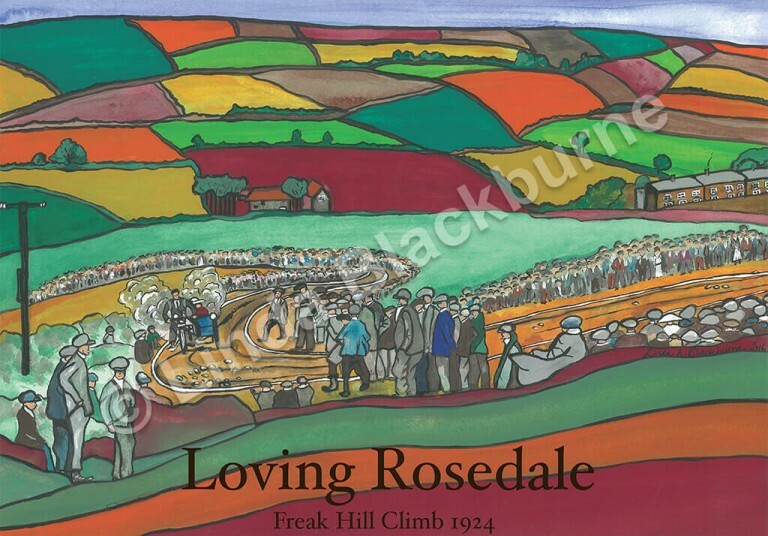 Dubbed the “Freak Hill Climb”, it attracted hundreds of spectators urging the racers to reach the top. 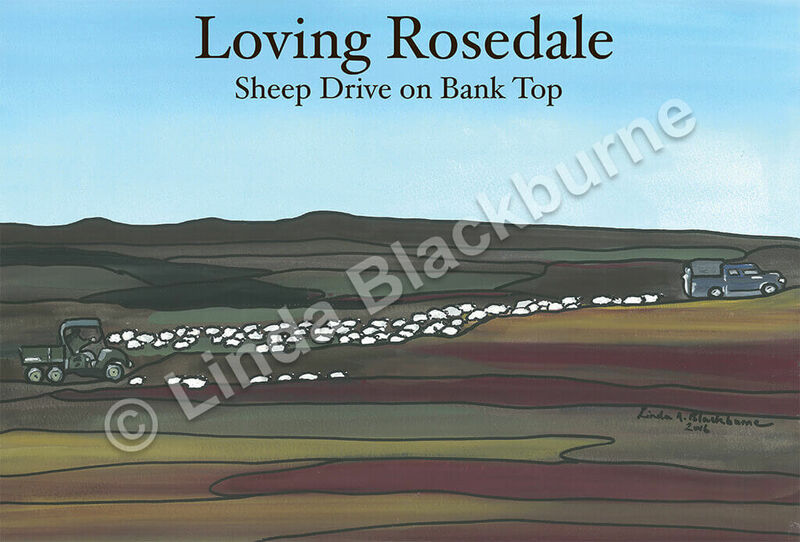 The painting was based on an old photograph donated to the Rosedale History Society. Upland sheep farming may be on the decline but flocks of sheep still shape the landscape of the North York Moors. The painting not only shows the familiar sight of a farmer driving a long line of sheep but also three barrows – ancient burial grounds belonging to early settlers between 1500 and 1000BC. 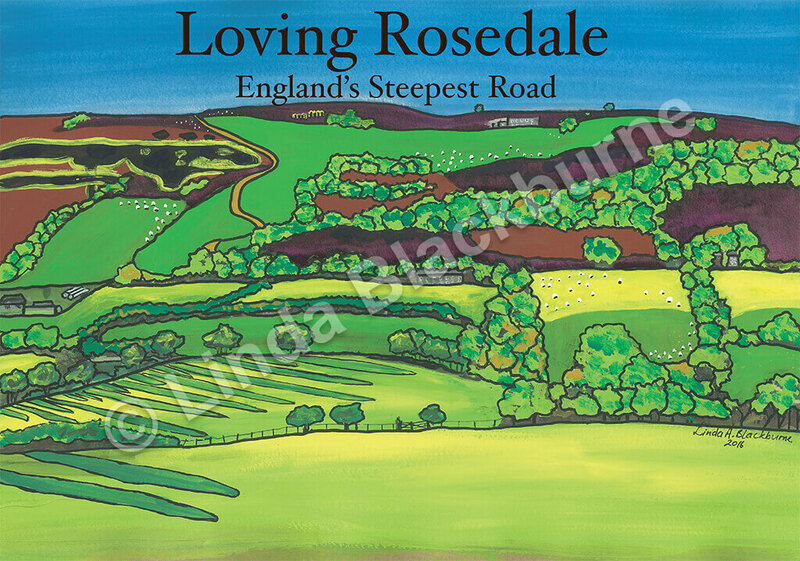 The romance between keen walkers and the hills and dales of Rosedale is timeless. Local residents paid homage to this honourable recreation with the founding of the Rosedale Walking Festival in 2013. The June event includes eight walks led by locals including an 8km hike along the old railway line. Moorland covers a third of the North York Moors National Park. 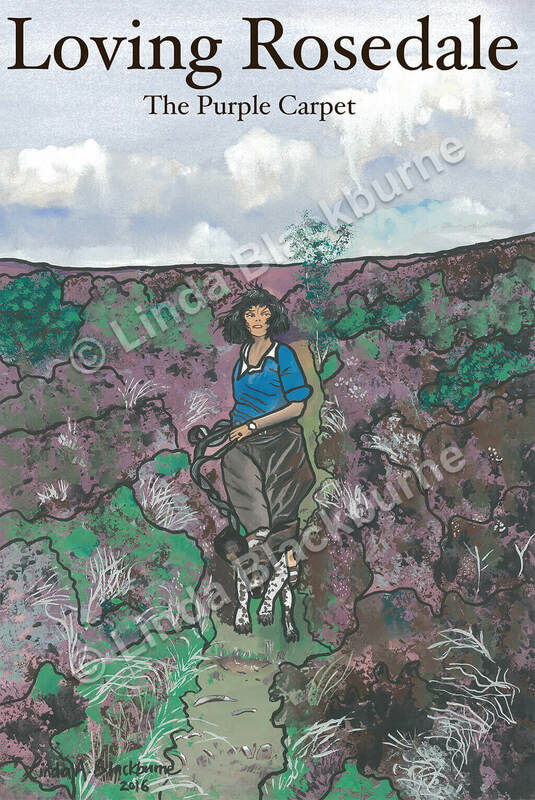 Flowering heather turns the moors into a purple carpet, a perfect home for honey bees, red grouse, curlews and golden plovers. About 70 per cent of the world’s heather is in the UK and the largest expanse of moorland in England and Wales is in the North York Moors. One of each design shown above.